Max is a bright and funny eight year old boy who loves to laugh. Born in Geelong, Australia, and now a resident of Hamilton, Ontario, he’s an active little guy who loves his Lego, video games, swimming and going to Cubs. His mum and dad can barely keep up with his wild imagination and constant games. Max rarely stops talking and one of his favourite topics is all of the things he’s going to do when he’s older, like learn to skateboard, ski and play hockey and soccer with his friends. 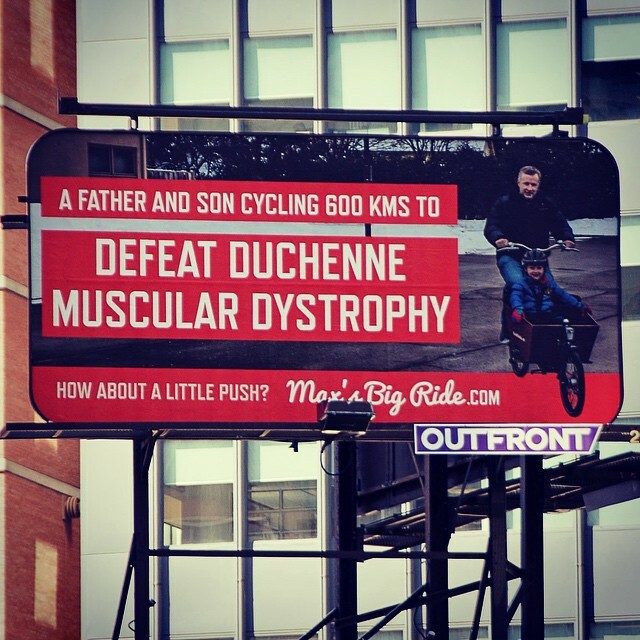 The problem is that Max has Duchenne muscular dystrophy, a terrible disease which doesn’t allow his muscles to develop like other kids, so unless a cure is found, he will never get a chance to do the things he dreams about doing in his future. Upon receiving his diagnosis, Max's family decided early on that they wouldn't sit back and let DMD take Max without a fight. For the past four summers, Max and his dad have embarked on Max's Big Ride, a 600 km cargo bike adventure from Ottawa to Hamilton to raise money for a cure. Along the way they won some billboards in downtown Toronto, met Prime Minister Justin Trudeau and too many truly kind and amazing people to count. In addition to Max's Big Climb, this summer Max and his family will also be doing Max's Big Ride for the 5th time and holding the 3rd annual Ice Cream Ride - a family friendly and ice cream-fueled bicycle ride held in Hamilton on June 22nd. Click below to watch a short documentary about the 2015 ride by our awesome friends at Steeltown Chick Productions.